Butterflies may look for an ordinary eye something trivial and insignificant, but in a deeper view of the soul they are truly unique beings. So dainty and delicate, so graceful and elegant, having such amazing colours and designs! Moreover, they are winged creatures and can fly, can flitter freely, as if dancing with all their beauty in the breezes, so airy and light. Wings are a special symbol: they embody the age-long dream of humanity of flight which in a deeper truth is the dream of freedom, of absolute liberty with no bonds or limits. So for the soul’s eyes the airy and marvelous freely flittering butterflies appear the symbol of the soul’s freedom, of its free termless flight with no care or trouble in the eternal summer of light and beauty and happiness and liberty, the all-blissful and all-free beings of paradise. They as if embody all these priceless paradisal qualities for which the soul in us yearns since the beginning of Time. 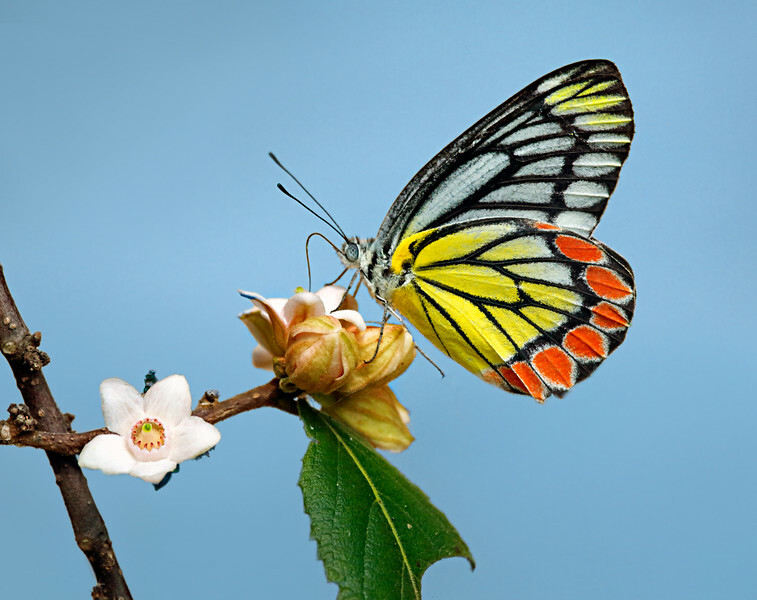 It is in this deeper view that many of the photographs of butterflies are presented here. Many photo-poetic works also attempt to reveal another states and dimensions of consciousness and being that may exist unnoticed near us and parallel with us — or in our own microcosm — or, perhaps, our macrocosm? — for in a deeper view they prove to be one, and this All-Oneness of Being is the main theme of my creativity. It is presented through the insights into some inner realities of the World-Being in the symbolic World of Butterflies. Please, read the poems below the photos. Butterfly Delias eucharis (Drury, 1773), the Pieridae family. Eng. Common Jezebel on pink flowers. Photo location: Gardens of Sri Aurobindo Ashram, surroundings of Pondicherry (India). Белянка Делия эухарис (Delias eucharis (Drury, 1773), сем. Белянки (Pieridae). Англ. Common Jezebel — «иезавель обыкновенная» на розовых цветах. Место съемки: Сады Ашрама Шри Ауробиндо, окрестности г. Пондичерри (Индия).